When working with a child or adolescent with an Autism Spectrum Disorder, ADHD, or another developmental disorder, meltdowns may occur that may be a result of sensory overload or an inability to self-regulate emotions. This course will provide many practical hands-on strategies to increase positive and acceptable behaviour while decreasing undesirable behaviours. There will be strategies on preventing meltdowns, tantrums, and rage. Suggestions for instructional consequences and self-management techniques to help prevent another meltdown will be provided. Videos and demonstrations using evidence-based techniques and a system of visual supports throughout the day will indicate how to use high focus and interest areas as incentives. This information and fun-packed course is designed for educators, therapists, counsellors, and all those who are interested in providing support to children and adolescents with ASD, ADHD, or other developmental disabilities. 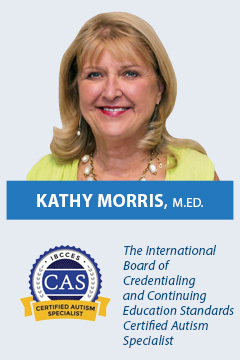 Kathy Morris, M.Ed., has been a speech therapist, teacher for self-contained programs (including students with autism, severe behavioural difficulties, and cerebral palsy), resource teacher and first grade teacher. She was also a diagnostician/supervisor for all grade levels. She was a LIFE Skills/autism/ behaviour/assistive technology consultant at a Texas education service center before leaving to start her own business in 1999. Her business, igivuWings, has reached families and educators throughout the world,. Kathy has had over 42 years of experience working with children and adolescents with severe behavioural difficulties.